Holographic models allow design intent to be visualised in situ before it is built, and will eventually replace drawings on construction sites. Building directly from these mixed reality environments extends the skills and capabilities of designers and builders by improving spatial understanding of design intent and reducing the risk of human error associated with extrapolating 2D instructions to 3D form. These new capabilities dramatically improve the ability of conventional construction teams to fabricate structures with significant variability in parts, form, structure, texture, pattern and so on, and in many cases completely reverse design viability as impossibly expensive and difficult proposals become straight forward, low risk and cheap. These complex designs can now be fabricated on standard building sites, with standard materials and tools, and without expensive expertise or design documentation. 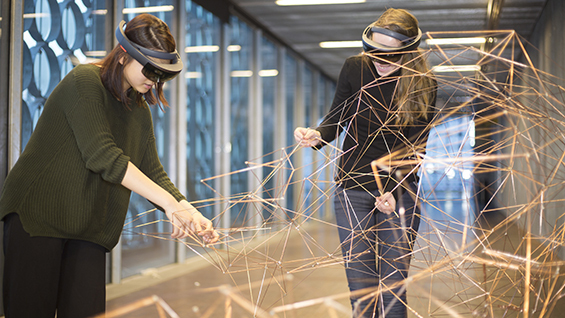 Gwyllim Jahn and Cameron Newnham will present recent research from RMIT in Melbourne that investigates the implications of Mixed-Reality (MR) assembly methodologies on architectural design through the lens of several architectural prototypes. Could making in MR allow us to refigure CAD-CAM not as a means of working to high degrees of tolerance and precision but instead as a return to craftsmanship, intuition and reflexive making? How will the medium of MR enable new forms of collaboration between designers and manufactures, or between humans and machines? What new architectural forms might be found in this superposition of the digital and the craftsman? These concepts will be tested through a design and build workshop utilizing holographic templates to rapidly iterate designs and fabricate prototypical structures without the use of conventional documentation.